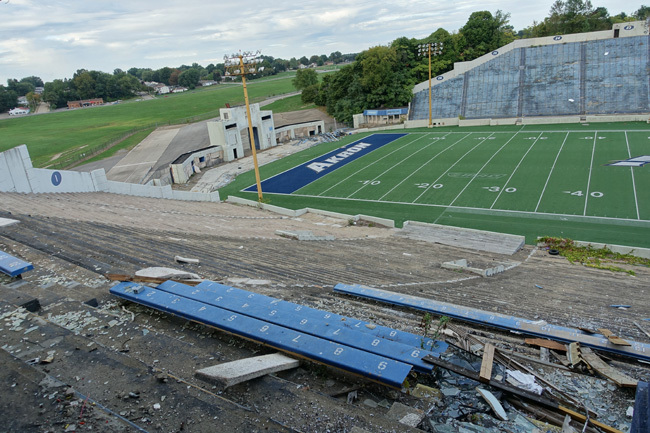 Rubber Bowl Stadium of Akron, Ohio hosted crowds of cheering football fans and concert goers for nearly seven decades. 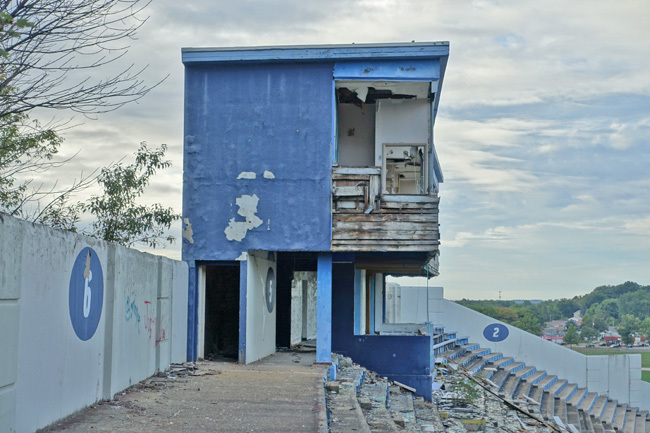 Made obsolete by the newly built InfoCision Stadium – Summa Field in 2009, the Rubber Bowl now sits empty and rapidly decaying from age and vandalism. 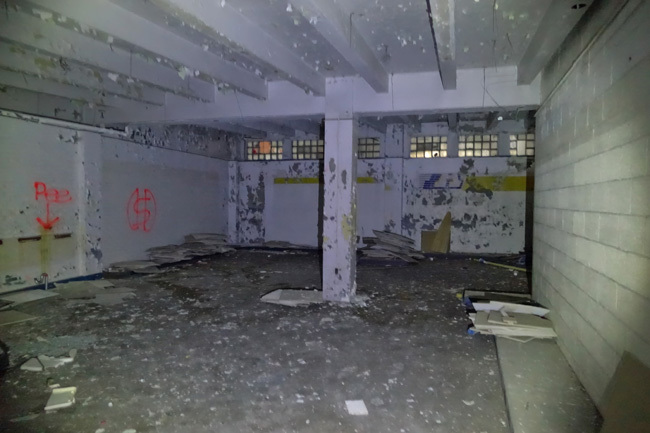 A short distance from the site of Rolling Acres Dead Mall, Rubber Bowl Stadium is another of Akron, Ohio's infamous abandoned places. 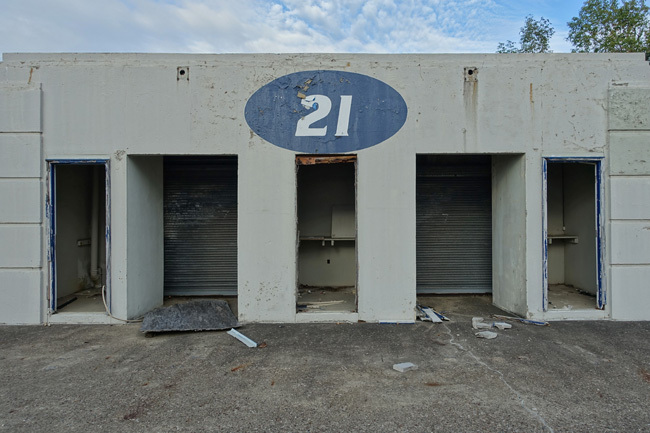 Situated on a large swath of land shared with Akron Fulton International Airport and Derby Downs, the beloved home of the All American Soap Box Derby, the stadium awaits its inevitable demise. 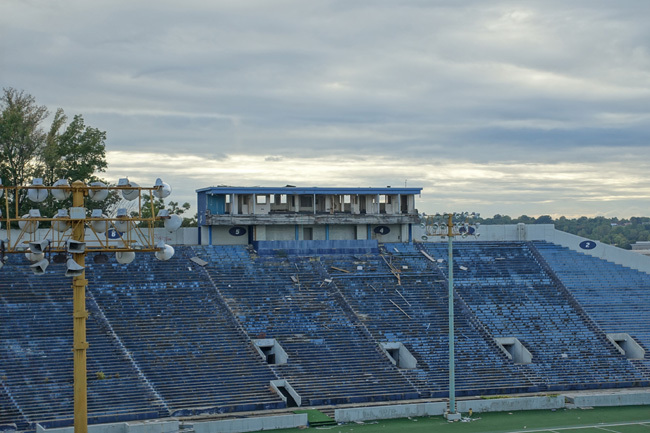 The Rubber Bowl is in very bad condition. 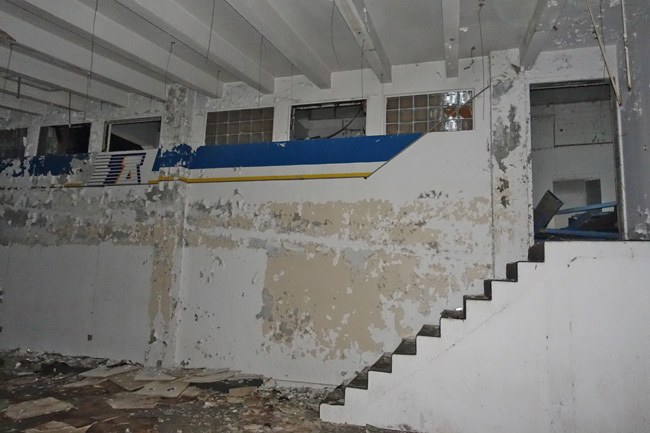 The deserted structures along its perimeter are crumbling, their floors covered by rubble from collapsing ceilings. Most of the stadium seating has been removed. 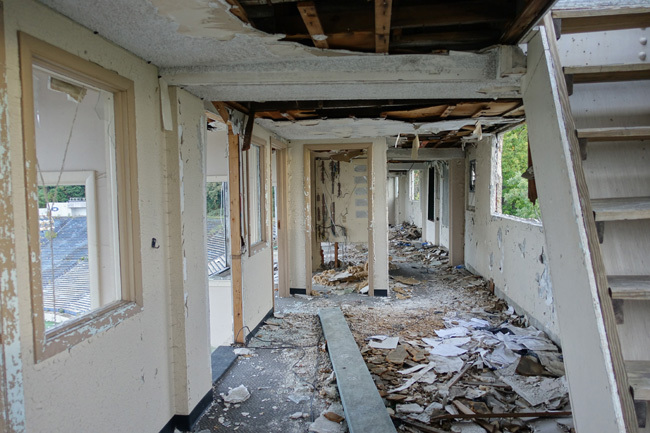 Much of it lies in heaps along the bottom of the spectator area. 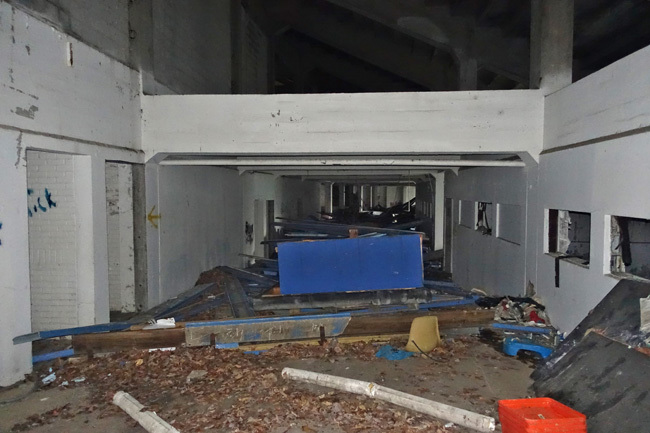 The dark passageways beneath the stadium are choked with twisted metal benches and other detritus. 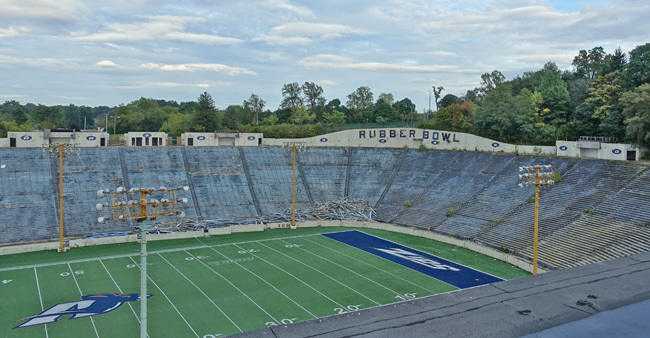 The Rubber Bowl was built in 1940 as the home field of the University of Akron's football team, the Akron Zips. It was named in honor of the tire industry, which was so prominent at the time that Akron was considered the Rubber Capital of the World. The stadium was built by the Works Progress Administration, a federal program that provided hope and opportunity during the Great Depression by creating jobs and livable wages for 8.5 million people. 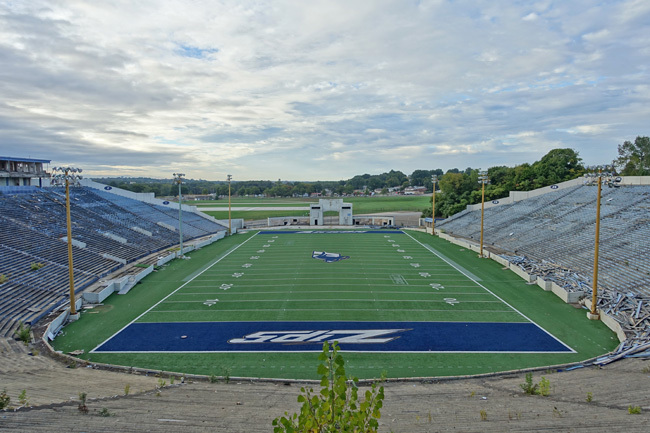 The Akron Zips played a total of 324 games at Rubber Bowl stadium, the first of which occurred on October 5, 1940. Several professional football games and about 1,500 high school football games were also played there. The original grass field was replaced by Astroturf in 1983. In 2003, the turf was upgraded to AstroPlay, which is still in relatively good condition. With a seating capacity of 35,202, the stadium served as a venue for concerts, circuses and other events. 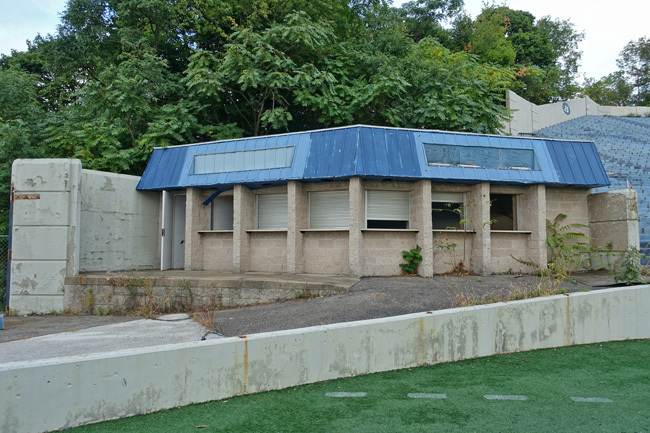 Over the years quite a few legendary musical acts performed at the Rubber Bowl, including The Rolling Stones, the Grateful Dead, Simon & Garfunkel, Bob Dylan, Black Sabbath, Alice Cooper, Three Dog Night, Tom Petty, Aretha Franklin, and Ringo Starr. 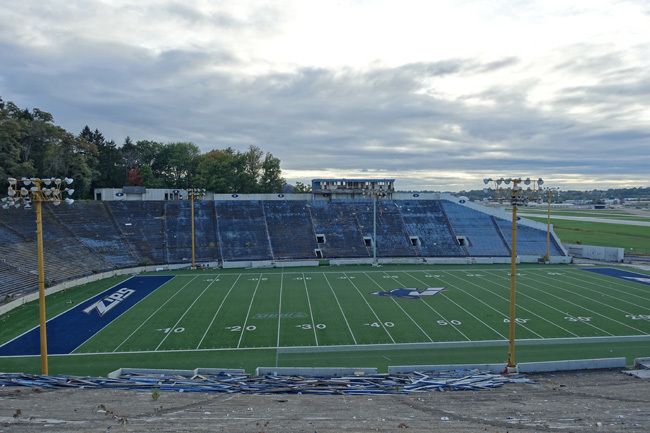 November 13, 2008 marked the Zips' final game at the Rubber Bowl. Facing off against the Buffalo Bulls, the game was televised on ESPN and went into an incredible four overtimes. Sadly, the Zips lost in what was the team's first overtime loss and their first four-overtime game in school history. 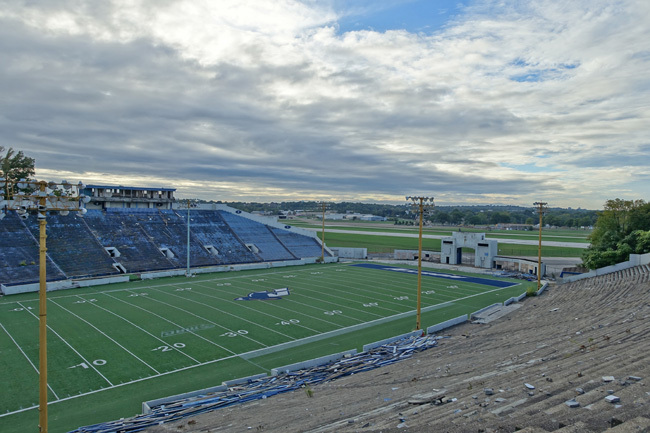 With the completion of InfoCision Stadium–Summa Field in 2009, the Rubber Bowl's time came to an end. 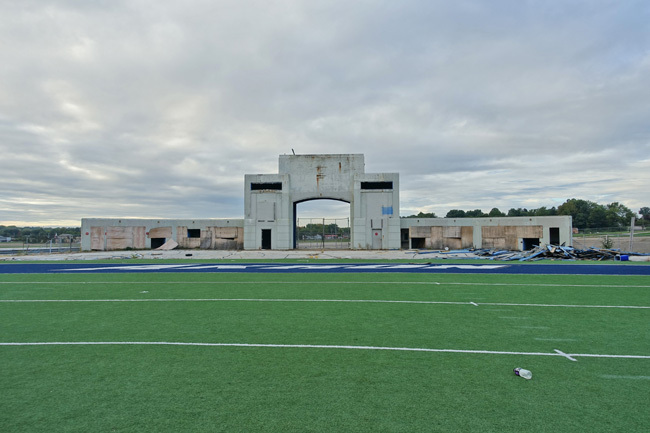 The new stadium is located on the University of Akron campus, which means that students no longer have to travel half a dozen miles to the Rubber Bowl to attend games and practices. In 2013, Team1 Marketing Group purchased the Rubber Bowl with plans to make it the home of a United States Football League team called the Akron Fire. Six months later, the league decided not to include an Akron-based team. Team1 modified their plans, hoping to build a dome over the stadium and transform it into a multi-use entertainment venue. 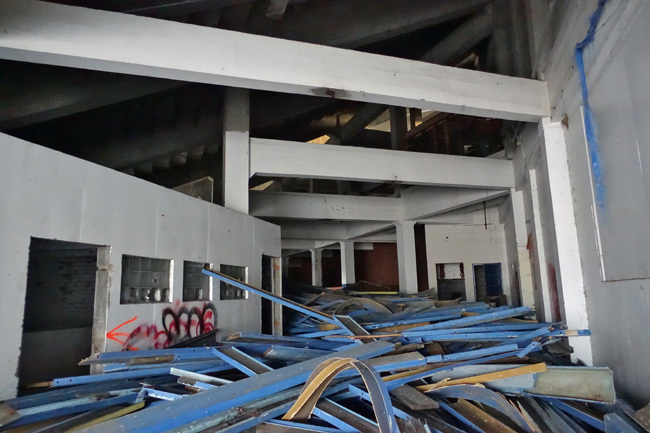 The first event, a hip hop festival called LOUD-Fest, was scheduled to take place in May 2015, but moved to another location after concerns were raised about the deteriorated condition of the Rubber Bowl. Plagued by zoning complications, financing difficulties, and a high tax burden, Team1 announced in late August 2017 that it would sign the property over to the Summit County Land Bank. 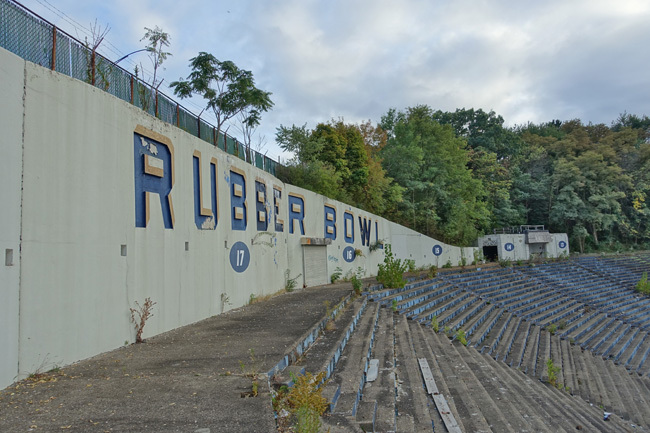 The Rubber Bowl's future remains uncertain. 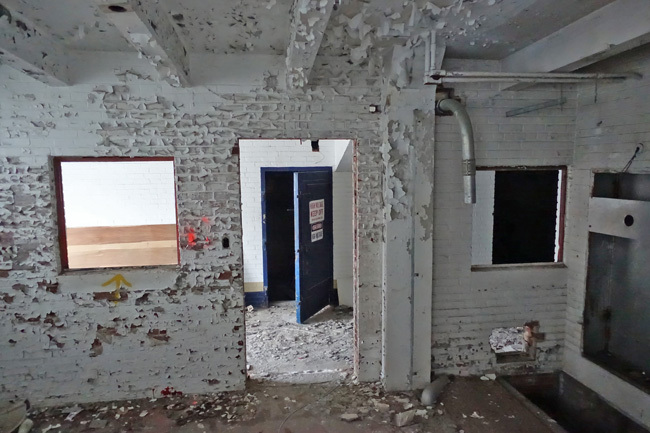 From Akron, I headed north to Cleveland to see the unique ruins of Newburgh Masonic Temple. Click here to explore it with me. To receive an email announcement when I post future articles, please subscribe to Places That Were. Yes, the turf was in better condition than any other component of the stadium. 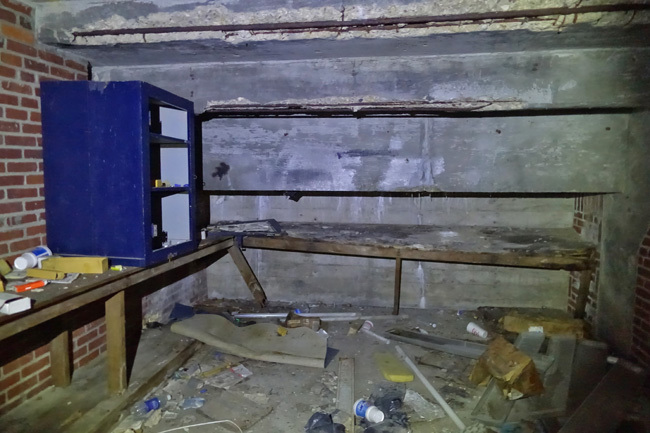 I believe it was installed in 2003, which means it only saw about 5 years of use before the place closed. Another nice article. Thanks for the good work. Jim, Another great story. Keep up the great work and enjoy your travels.